Two paintings have demanded my attention this week, and between holiday society and WordPress society (Thank you everyone!) and email greetings, I have not had time to even LOOK at the Christmas images on my camera! Z-Frogs — Do they make you smile? This was “not so” for the McDonalds in San Clemente Ecuador! John and Mary, who seem capable of leaping tall buildings with ease while juggling society and WordPress and images as well, live a few hours down the coast! They just served a triple dose of posts about their Navidad experience. Reflect on your own Christmas memories and then see how the McDonalds celebrated – christmas-in-san-clemente-part-two — I remain in awe of John’s Papa Noel role as the year-round jolly good man in San Clemente! As is often said, ‘Behind every good man is a good woman,” and Dear Mary basks in the glow of her husband! Tireless in her capacity to love, Mary spreads goodwill through her sensitive ways of giving. Part one of the above series of posts shows some of the gifts from her heart, and part three shows how she combines forces with others for memorable events! A kind gift of her heart to me came in the form of a zebra painting. Here’s the amazing gift from her heart that smiles at me each day! (This post won’t save and won’t preview, so I suppose this happy rainbow zebra demands a formal presentation NOW/HOY!) May this post help us remember that the best gifts are the ones that come from the heart. Thanks, dear Mary, for your kind and generous heart! I agree – a gift a love…. Mary had a good idea with that rainbow zebra!!! yes, my dear! i’ve had problems on and off all day too. tonight i’m having trouble replying to comments.. i’ve tried through the notification window and through the drop down menu on the upper right corner, and on the individual replies on each post… they just don’t want to go through! this morning i had trouble uploading or finding photos in archives, and the draft would not save or preview! maybe there’s a solar flair to blame? I kept myself sane by staying away from the computer. All day. And now it seems to be working. good morning! so far mine is working better as well! at least the first few replies are working! have a great day amiga! Very cute. WP must have been very busy today or making adjustments as a few of us struggled earlier on. I had jobs to do, so went off n did them, and I’m hoping it’s better now. Off to find your other Z post. yes, it’s working much better this morning. i couldn’t reply to comments or manage photos. or i’d place a search for an old photo and it would say there is none, and… well you know! it was as if i had a virus! Zebras always look so somber and stately to me…..this one looks full of joy and ready for fun! I love this so much! I shared on FB! You have been SOOOO busy today!!! but not really! it’s great to have so many things that i love to do! thanks! tis a happy rainbow zebra for sure! A rainbow zebra is joyful! What a creative art work, Z! she’s amazing! i’m very proud to watch her progress, and i was so pleased/surprised and happy to receive the rainbow zebra! One must love that rainbow zebra 🙂 Happy holidays Z, and a year full of happiness! tis an easy zebra to love!!! thanks, and happy holidays to you as well! Christmas in San Clemente was very interesting, and I too love the idea of a rainbow zebra. Weather here is uninspiring – just gray and drizzly, but we went for a drive into the mountains and saw snow the other day. I’m happy not to be shoveling it, as I know you are. you are right! i cannot imagine having to shovel snow in order to leave my home! once i had to haul away broken pine limbs after an ice storm, and that task took hours. when i returned we’d had a second storm, and i had to pull them away to get home again! over the next few weeks/months if i find myself bored or disgusted with a task, i’ll remind myself that i am not shoveling snow! thank you my dear friends! it was my pleasure/con mucho gusto/ to feature the rainbow zeebra and say a few genuine words about the two of you! if only all posts were so easy to write! Thank you dear friend for featuring us on your blog.. love and hugs sent your way..
A joyous rainbow Zebra; a great gift. Well done, Mary — and I second the motion! oh no.. i’ve been through just enough to keep that hard edge to stop most meltdowns!!! you win, hands down! so sorry that i missed this comment! than you; mary is very kind, sensitive and talented, and all of that shows in her painting! Z-frogs are very cool. And of course they make me smile – you know how I feel about your art. 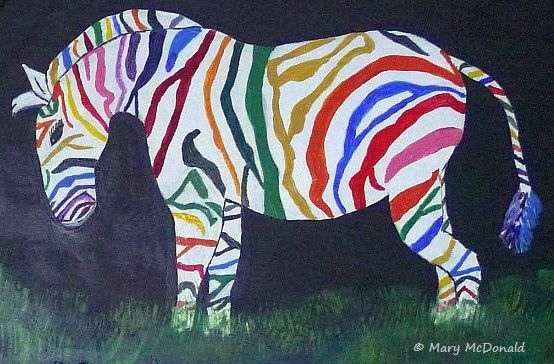 Mary’s rainbow zebra is amazing as well. How lucky to be presented with such a cheerful animal. Too much talent. My jealousy is seeping through again. The rainbow zebra makes me smile. Thank you Mary and Z.
Oh what a wondrous creation! I have always loved zebras and this takes them to a whole new level of beauty, magic and FUN! Thank you for sharing your joy. Thank you! Mary’s gift was painted and given with amazing love; it represents unconditional love!!!! hey! the painting is mary’s copyright – it was a gift from her to me, so we’ll have to ask her. i am sure that she will be honored! Thank you Alia…I would be honored :)..and thanls z for letting me know..
you are so very welcome! congratulationis, estrella! you’re one step closer to being an estrella grande!